I thought Obama did a pretty bangup job of (a) pointing out that the GOP got us into this nasty deregulated mess and (b) actually speaking to the concerns of voters--the economy, health care, jobs, etc. Whereas McCain just kept rambling on about overhead projectors and Joe Lieberman or something. That said--I sure do miss John Edwards. Obama kept talking about the middle class, and McCain sort of mentioned "middle income" folks, but whatever happened to caring about people who aren't even "lucky" enough to have a home to lose? Yeah, it's too bad Obama was unsuccessful when he tried to get Congress to do something about the risks Fanny and Freddie were taking with government backing. Pretty bold, considering how much money he'd taken from them. I was listening on the radio,and even then could hear everyone flinch at the "that one" remark..when i saw the video,the black guy in the audience ,behind Barack Obama does the flinching for him and us..latest news today that Palin has been found guilty of abuse of power! 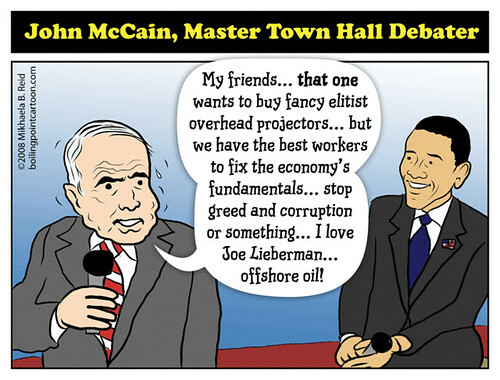 Surely this has done for McCain ?..as far as the economy goes,i vote for the Black Swan" guy. I write most of the Forbidden Planet blog and the BBC just dropped me a line to say the programme with you and the Cartoonists With Attitude went out this week on BBC Radio 4 and that they've also put the episode onto a permanent link, not just the usual Listen Again feature where you get seven days to catch a programme: http://news.bbc.co.uk/1/hi/entertainment/7669019.stm. From what they told me it looks like they will put the four progs in the series on permanently (the Trudeau one is already up), so you can direct your friends to it to your heart's content. BTW, are you mob affiliated with Cartographers With Latitude :-)?